A parent’s worst nightmare happened on July 10, 2015 in Spartanburg, South Carolina for the Headley family. The Spartanburg County Police walked right in the front door of the Headley’s home while Danielle and her four boys were sleeping. William Headley had left for work earlier that morning and the front door was unlocked because the family felt safe in their community. Danielle stated that a female officer, later identified as Investigator Tracy Moss, walked into her bedroom and asked if she was Danielle Headley. Danielle replied that she was. Danielle states: “The cops busted into my house, didn’t knock or identify themselves. She (the investigator) said they have a search warrant and you need to get up and get up now!” Investigator Moss proceeded to demand that Danielle remove Jack from the crib in her room, unhook his feeding tube and bring him into the family’s living room. When Danielle walked into the living room, her three older boys were lined up on the couch. Danielle stated that: “Apparently she got my kids from their bedrooms before she came into my room.” According to Danielle, there were five or six officers to assist executing a search warrant for all electronics and medications in their home. The Emergency Removal Order served on that day states that they were contacted by Greenville Health System, Dr. Nancy Henderson, and the Headley’s four children needed to be removed due to mother being suspected of Munchausen Syndrome by Proxy. Danielle had made the mistake of asking for a referral to another hospital for their youngest boy, who has had health problems since he was born. Now, all four of her boys have been kidnapped by the State, and they are threatening to vaccinate the youngest boy who has health problems tomorrow against the parents wishes, even though he is known to have severe reactions to vaccines. There are too many stories like this, Justine Pellitier's family finally got her back and last I heard they were suing the state of MA. I hope the expense is so prohibitively burdensome t the state, that ever doing this again would render the Government bankrupt. It's just not ok.
At this point American families need incredible security, and lawyers on retainer as a form of insurance against warrants and child seizure. The lesson here is never tell a doctor you want a second opinion for any serious medical diagnosis. This is especially true of the diagnosis is unusual and research worthy. Smile and agree act appreciative and pump the docs ego. Doctors are really just like mechanics, but they are arrogant. then move your family over state lines, establish residency, rent a small apartments and use the address without ever being there.and get a lawyer fast and find a new doctor and arrange for that doctor to get the new state to file protective orders. can get more supporters from your own state to start your own group. Hope to see you there...."We the People"
Roslyn-Reed said: > stacy-headley said: > > This is jack dad we still haven't got them back all we are getting is the run around from dss u can email me if u want williamh29378@msn.com > > Hurting the kids. Mr. Headley, . I just e-mailed you. Please get in touch with me. Thanks! As a mom of 4 young kids, I was heartbroken when I read your story. Have you shared your story with change.org? I get regular emails from them petitioning people's/animal rights with stories like this. I often get updates that the petitions were helpful and the problems get resolved. Please look into it, they have a massive email list and this support could help you get your boys back home. I am so sorry you are going through this nightmare, my heart goes out to you. 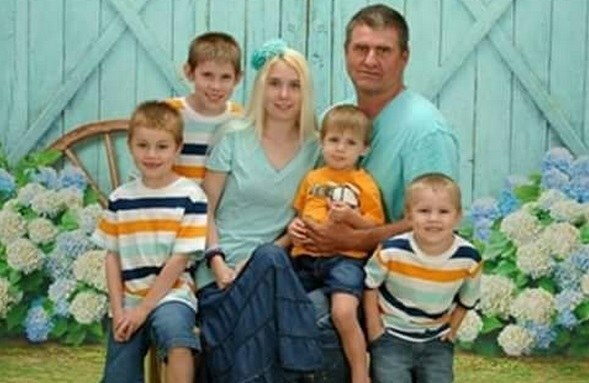 stacy-headley said: > This is jack uncle my brother and his wife are fine but dss still has there boys and no one still can't have any contact with them I was just wondering why they are keeping all family from seeing the kids? Here in Missouri my nephew was taken from his mother and as his aunt ( his father's sister) and his grandmother was allowed visitation until I received custody. Emma said: > Can anyone tell me what has happened here? The facebook page has closed and all information has been deleted. I've been following the family on FB for years and would like to know how they are doing? It is all most unusual. Not tried getting to be rude but these people are a hoax. Our oldest dated a member if their family and luckily we got her away. My daughter said that the mother was always making the child sick so when I came across this I was shocked to see so.eine else accuse them. Not to mention Danielle is married to her own father who raised her from a little girl and divorced her mother and they had four boys. We brought them food once and their home was absolutely destroyed and when one of the boys hollered we were there she called hime a basted from the back room and the poor little one jack has puss and blood around his feeding tube and feces run. I guess down his leg with no clothes on but underwear. I am glade someone has stepped in.Not trieing to be rude but these people are a hoax. Our oldest dated a member if their family and luckily we got her away. My daughter said that the mother was always making the child sick and makung gofundme accounts for expenses and then bloeing the money so when I came across this I was shocked to see someone else accuse them. Not to mention Danielle is married to her own step father who raised her from a little girl and divorced her mother and they had four boys. We brought them food once and their home was absolutely destroyed and when one of the boys hollered we were there she called him a basterd from the back room and the poor little one jack has puss and blood around his feeding tube and feces running down his leg with no clothes on but underwear. I am glade someone has stepped in. I for of e wish I would have stepped up. I have always about those babies and this was 2 years go. I really wish the best for these boys. Admin---OK said: > A parent’s worst nightmare happened on July 10, 2015 in Spartanburg, South Carolina for the Headley family. The Spartanburg County Police walked right in the front door of the Headley’s home while Danielle and her four boys were sleeping. William Headley had left for work earlier that morning and the front door was unlocked because the family felt safe in their community. > > Danielle stated that a female officer, later identified as Investigator Tracy Moss, walked into her bedroom and asked if she was Danielle Headley. Danielle replied that she was. Danielle states: > > “The cops busted into my house, didn’t knock or identify themselves. She (the investigator) said they have a search warrant and you need to get up and get up now!” > > Investigator Moss proceeded to demand that Danielle remove Jack from the crib in her room, unhook his feeding tube and bring him into the family’s living room. > > When Danielle walked into the living room, her three older boys were lined up on the couch. Danielle stated that: > > “Apparently she got my kids from their bedrooms before she came into my room.” > > According to Danielle, there were five or six officers to assist executing a search warrant for all electronics and medications in their home. The Emergency Removal Order served on that day states that they were contacted by Greenville Health System, Dr. Nancy Henderson, and the Headley’s four children needed to be removed due to mother being suspected of Munchausen Syndrome by Proxy. > > Danielle had made the mistake of asking for a referral to another hospital for their youngest boy, who has had health problems since he was born. Now, all four of her boys have been kidnapped by the State, and they are threatening to vaccinate the youngest boy who has health problems tomorrow against the parents wishes, even though he is known to have severe reactions to vaccines. My goodness. Boy what a bucket of NUTS in S.C. GOD needs to get hold of that state and stop them from destroying families. If they need to show things bad about families and make up things to keep job. Public needs to fire them. After all it is your tax dollars. stacy-headley said: > This is jack dad we still haven't got them back all we are getting is the run around from dss u can email me if u want williamh29378@msn.com Hurting the kids. EndoMarchPixels said: > A family member of mine had a HORRIBLE experience with Spartanburg County DSS the same day as this family's - July 10th. The police came in, without knocking, they took the children. Thankfully, however, other family members were able to step in and take temporary custody of the children, in this case, until things were straightened out. And, oh boy, were they a MESS! > > This was the first case of the social worker that my family member dealt with. There was no hearing within 72 hours. They were just ordered to clean up the house, which wasn't that bad - because it was SPOTLESS in only a few days with only 2 people cleaning - and then ordered to take parenting classes. Also, both were charged WITH Cruelty to Children. The officer didn't agree with what was happening in this case either, and ended up getting the charges dropped and the kids back home in less than a month... But it was HELL on our family. > > I can't even imagine how the kids (and the parents of children) that can't go with other family members must feel :-( My family member got so lucky that we could help, so the kids didn't go into other care (foster, group, etc.). But only ONE person, aside from myself, was officially "approved" to be with the children alone, or to supervise the visits anywhere they went outside of the home. They held misdemeanor charges of other family members, that were over 10 years old and had nothing to do with children, against them and they were not allowed to be alone with the kids. These people helped to raise these children. It was ridiculously strict. Like they were TRYING HARD to find anyone and everyone "unfit" to care for them, so they could TAKE them entirely. Thankfully, our family is persistent and two of us had no charges at all. > > What on earth is going on with Spartanburg County DSS? I mean, obviously they're doing things that they shouldn't, but how come there aren't more of these cases being internally investigated? They're out of control! > > My family member also didn't get an apology or ANYTHING, for the wrongful removal of the children, and the hell that came as a result. > > They need to be stopped. My daughter is in jail because of the same thing. spartanburg dss. I have not see my grandkids since april of last year. People have been horrible. I pray that they get their boys back. This has been a nightmare. Any updates on this. Their facebook page was back up and today it seems to be down again. Wow! I just read this story. SC yeah I know all too well how they work. I want an update on this case if not be connected to the parents for I have a story about the whole baby market in sc. I know they were advised to take the fb page down, but I wondered if there was an update. all has gone incredibly quiet and i hear there was another court date on 10 August. They have been followed and supported by so many people including myself on fb for so long it is really odd and concerning to hear nothing at all. does anyone have an update?